..:recycled minds:..: Pillaging Pirates or Environmental Activists? 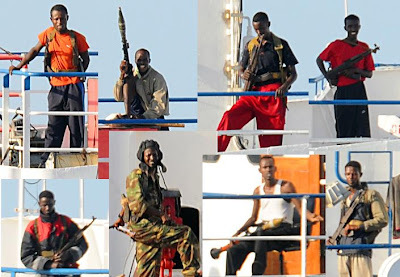 Last month, Pambazuka News published an interesting article by Andrew Mwangura, who runs the Seafarers Assistance Programme, about the Somali pirates who have been making headlines in mainstream media (most notably for the kidnapping of a British couple in October 2009). Mwangura hits many key issues surrounding the piracy in the Indian Ocean and the Gulf of Aden, contextualizing the hijackings in the conflict between UN condemnations of the piracy versus the illegal, unreported and unregulated (IUU) fishing and illegal dumping of nuclear waste in these same waters. He also brings up the cycle of perpetuation that comes from the issuing of fake fishing licenses by Somali warlords, who sell the permits at US$30,000 to US$15,000 (good for four months). But with pirates blocking access to the waters, profits from the tuna industry have fallen significantly, affecting the local economy, which, in turn, increases the value of the fines and ransoms collected by the pirates. The pirates, Mwangura argues, "genuinely believe that they are protecting their fishing grounds (both 200-mile territorial and EEZ waters). They also feel that they are exacting justice and compensation for the marine resources stolen and the destroyed ecosystem by the IUUs. And their thinking is shared and fully supported by the coastal communities, whose protectors and providers they became." Although different in scope, the foreign exploitation of Somali waters brings to mind the recent BP oil spill in the Gulf of Mexico and the validity of environmental activists. In the latter, we have a case of big business run amok, which has resulted in the devastation of millions of people living along the coast. How welcome would pirates be here, trolling the Gulf in efforts to prevent another environmental disaster? The BP spill, however, pales in comparison to recent oil spills in Nigeria, whose residents have witnessed over one million gallons of oil spill into their waters in the month of May. A Guardian article recently laid out the horrific conditions the oil industry has wrought in the African country, stating that oil spills have contaminated the region for over 50 years, and the government has had little response. Ironically, Shell (just one of the negligent companies) blames 98% of its spills on vandalism by militants, a claim disputed by community members and environmental groups, who instead blame the shoddy oil rig infrastructure. In all of these situations, we perhaps see a complicated cycle of protective piracy, corporate piracy, and thievery piracy, with no clear solution. In the U.S. we hear about how the Gulf incident is going to be the end of the world. Sadly it's already been over for a lot of people out there. I think it's just a matter of sitting back and watching it all burn. Especially now that BP has permission to burn off the gas and oil that they have collected from the spill. It should be one heck of a show. It's pathetic that no one wants long term solutions. If we did we'd have a revolution.